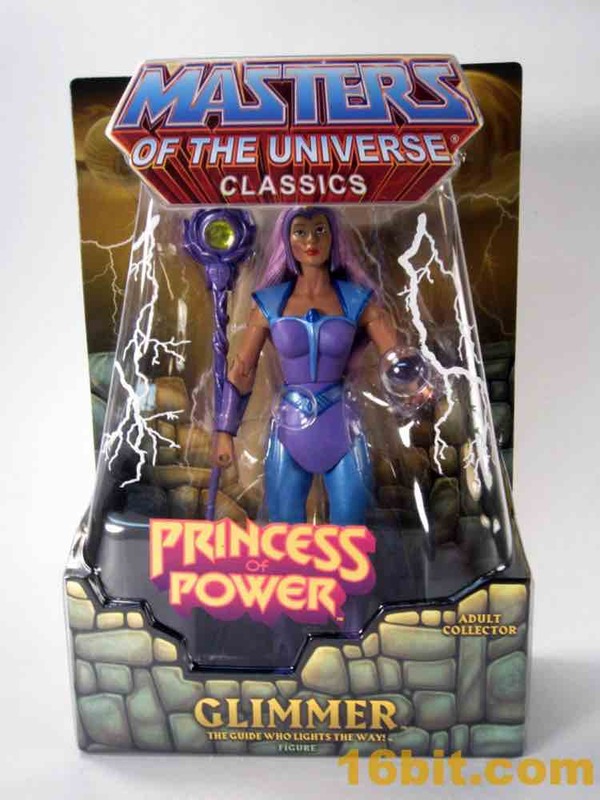 I should really kick off all Princess of Power reviews with a statement like "I don't know who this is." 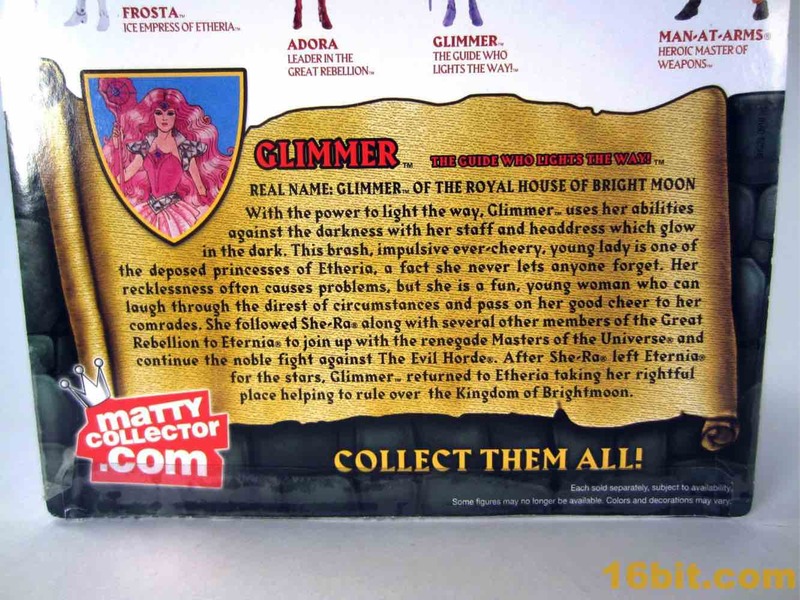 I remember Glimmer as kind of a ditz, but I may be wrong, and there's nothing wrong with being a bit of a flighty person if you get the job done and indeed Glimmer gets the job done. 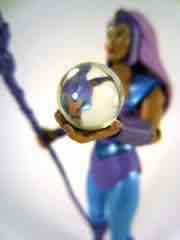 Her figure more closely resembles the She-Ra cartoon than the original doll figure. 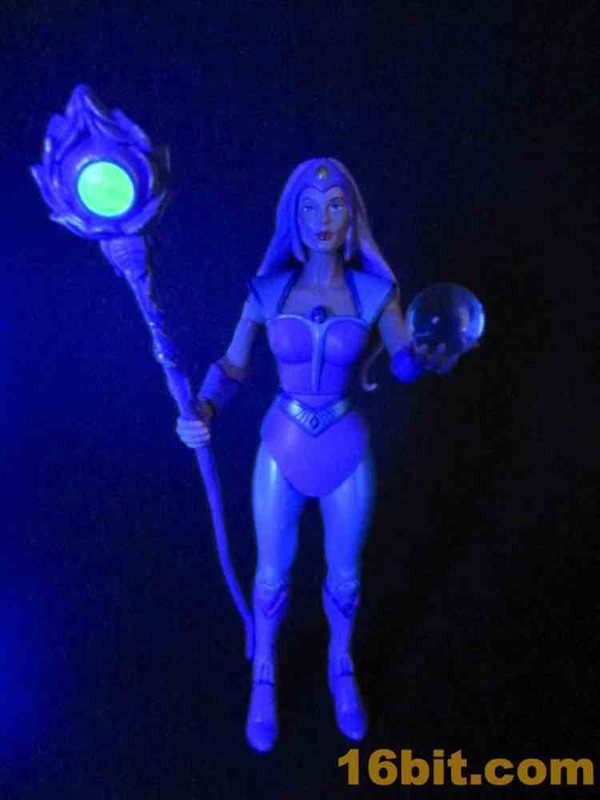 As pretty much all of these figures go, she looks good. 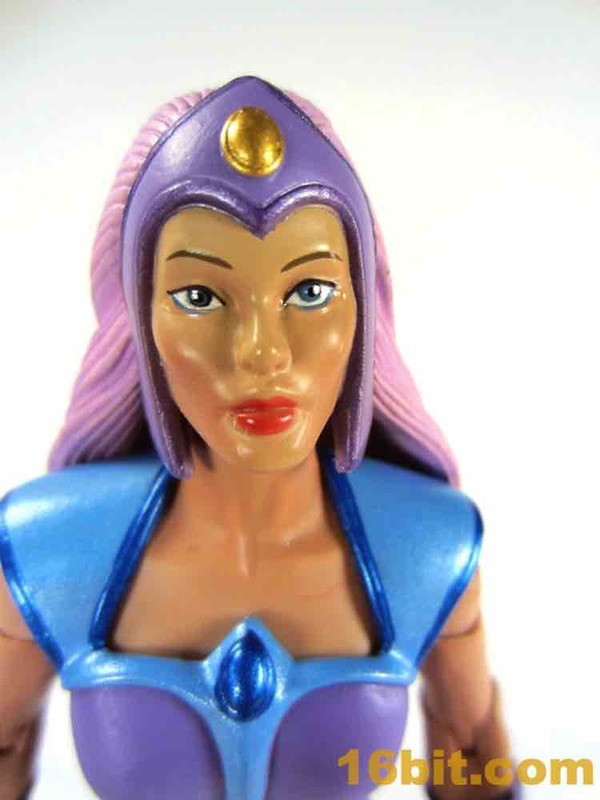 However, the original doll was much pinker, and the animation model was much more youthful with large, incredibly bold eyes and bright red lips. The toy is more measured with a less bold set of eyebrows, pinker lips, and a more muted overall look. 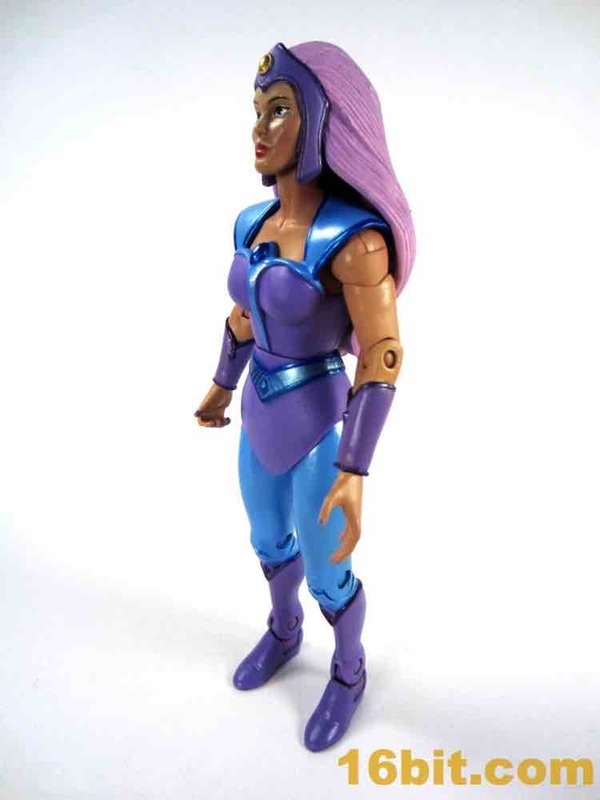 She seems more serene, and that looks good on a shelf of toys but I still kind of wish she had that somewhat silly look we saw on the original cartoon. The purple body suit and pale blue leggings are here, but look a little different. 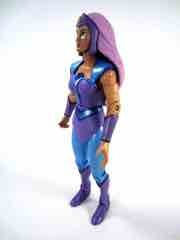 She has metallic shoulder armor and blue piping, which is set off quite nicely. 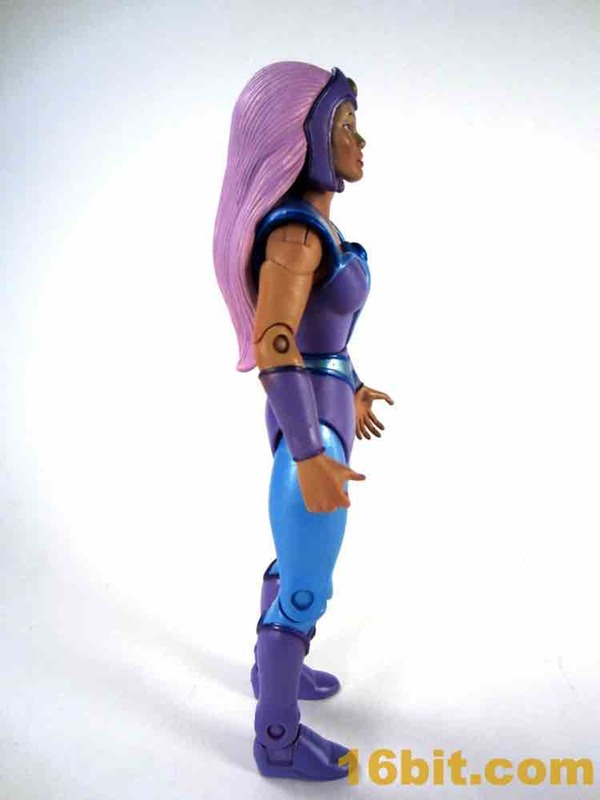 Her boots are also lined with dark metallic purple, as is, well, every other purple garment. 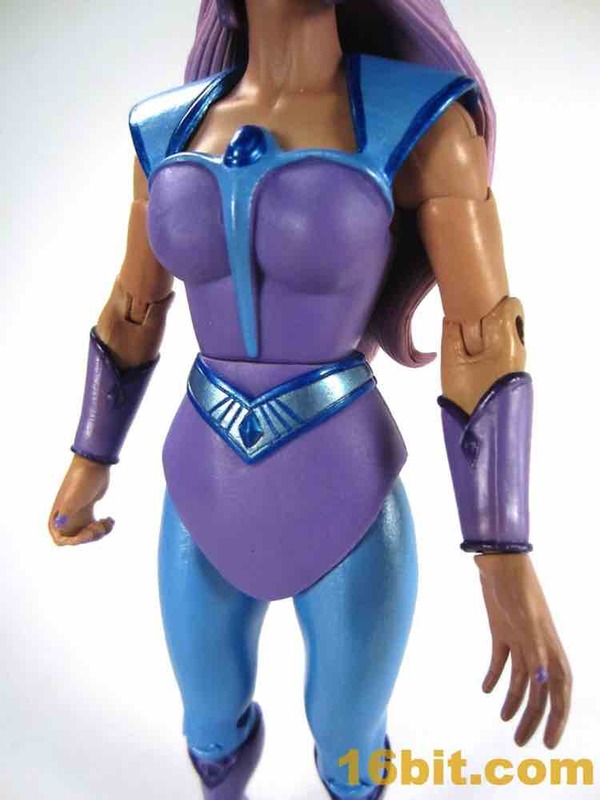 I wish her face was just a little more like the cartoon, but the body is on par with the others and the accessories are even better. 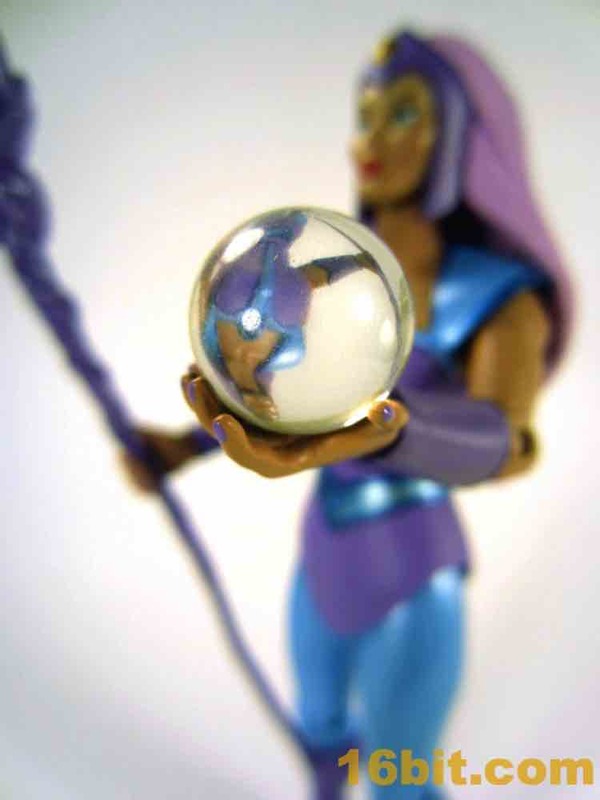 A crystal-clear crystal ball fits in her left hand like it was designed for it - it was - and it really looks wonderful. 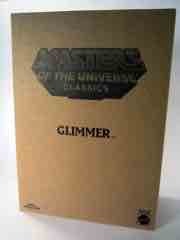 I hope it holds up to time, because it's a gorgeous accessory. Both hands sport purple nail polish, and have no real problems holding the gear. 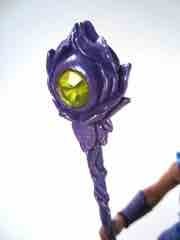 Glimmer's right hand holds a sizable purple staff with a yellow gem and metallic purple highights. 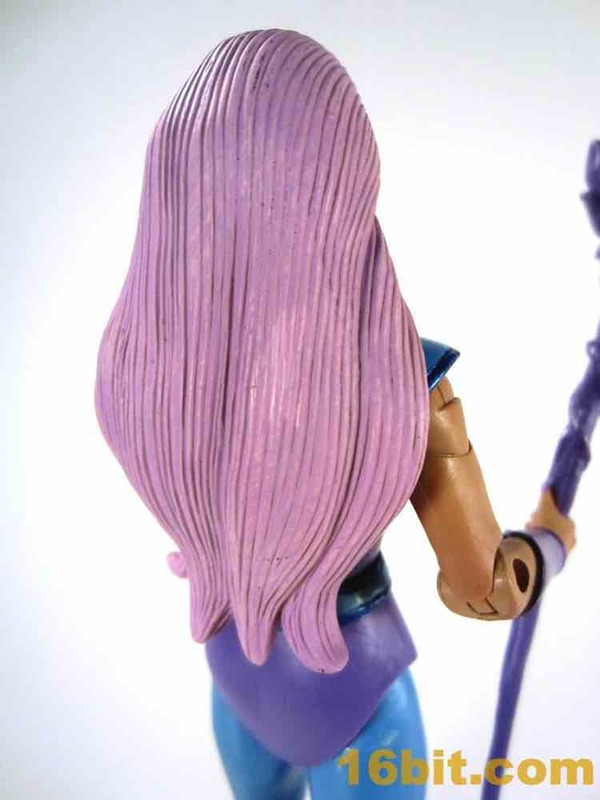 Little details like these extra paint applications go a long way to making this feel like a better figure, and of course, so does inflation. 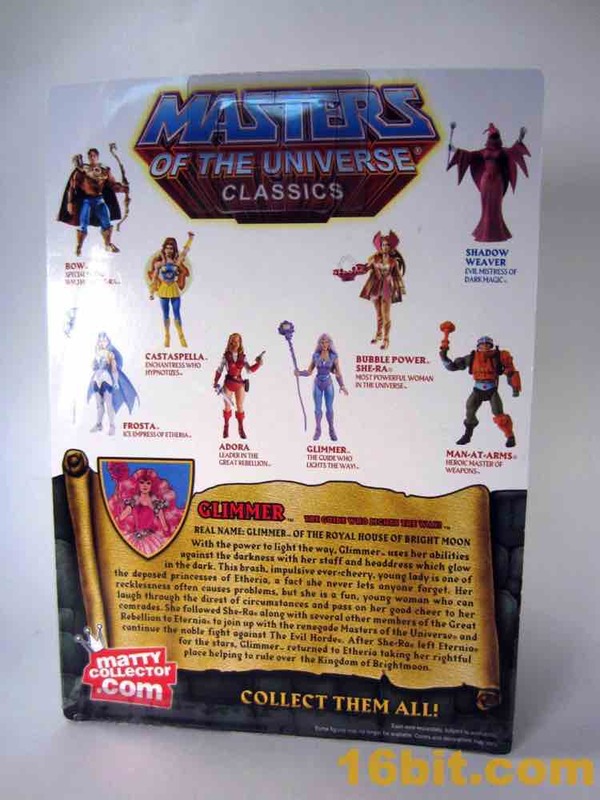 $20 in 2008 seemed expensive, $27 in 2014 seems about right. 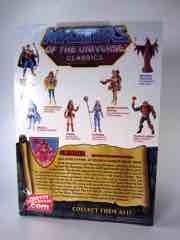 Masters of the Universe Classics' ability to endure is also what makes it dull. 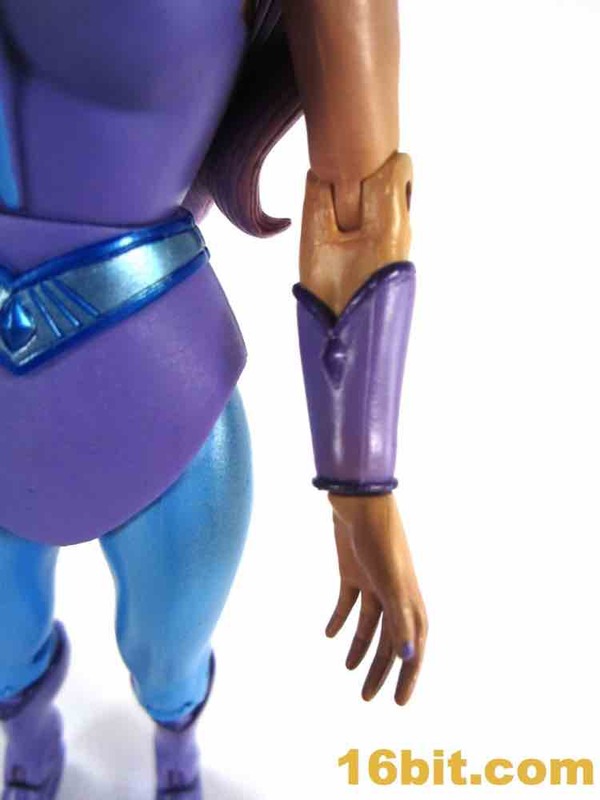 I can tell you that a figure is going to be pretty good just by seeing a prototype - the quality is consistent and Mattel's frequent reuse of parts makes it easy to know what will or even won't work. 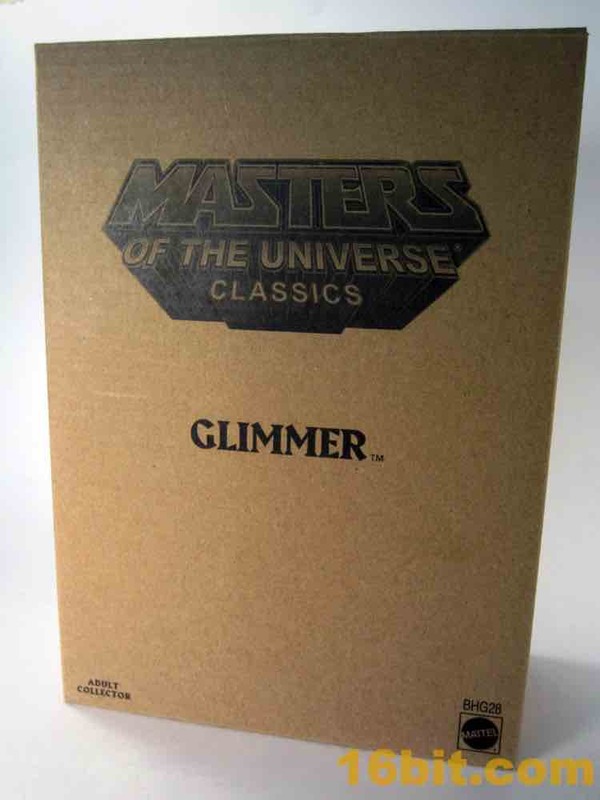 Glimmer's ankles are nice and sturdy, her arms strong, and her hands stable. She even has little gems on her head, belt, shins, and, sternum. 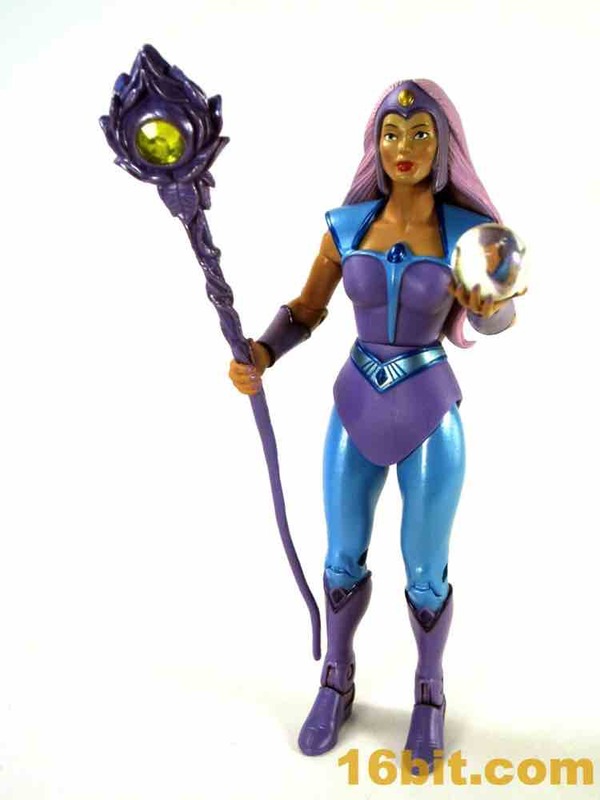 I can't imagine people who wanted an evil alien or Evilseed will be happy with Glimmer, but as a fairly significant character in the episodes of the cartoon I saw, I'm glad to see her in this toy format. 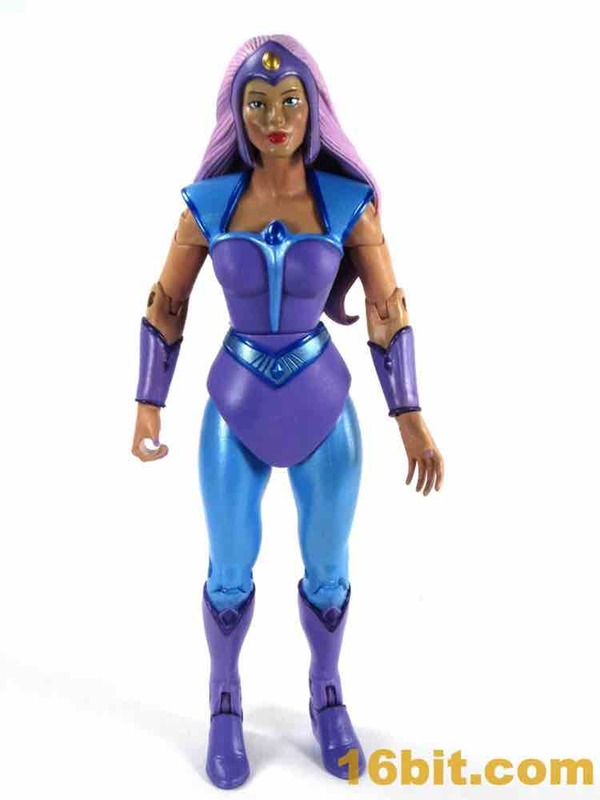 The doll doesn't really seem to look right, so the action figure will do nicely - and even better, should someone customize the face a tiny bit. 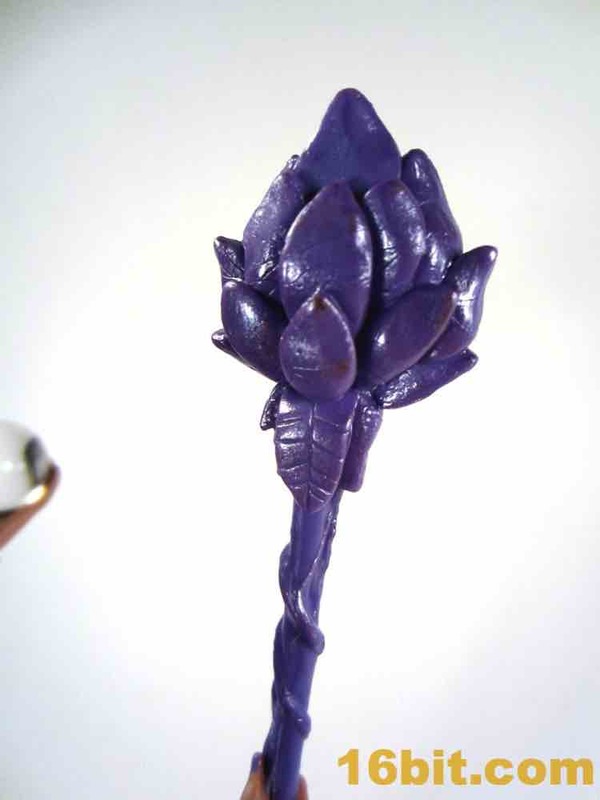 It's a quality figure, if not a terribly outstanding one.